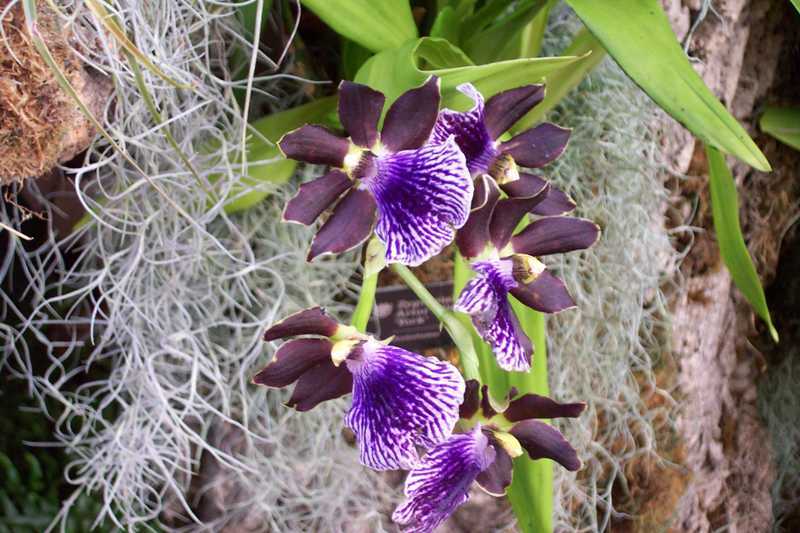 Long-time orchid grower Carol Gravens shares her list of 10 of the best orchids to grow in the home. Like her you can have orchids blooming in your home every month of the year. This is the easiest orchid to grow in the home. It blooms in winter with long flower spikes containing many spectacular blooms that last for months. The flowers may be white, purple, pink, salmon or yellow; some are speckled and blotched in interesting patterns. It is commonly called the moth orchid because of the appearance of its flowers. An east window is ideal; it prefers lower light. It likes temperatures in the 70s and 80s degrees F during day, and in the 60s at night. Humidity should be above 50%. Water mature plants weekly and feed after watering at quarter to half strength of the recommended label dilution. This is the classic corsage orchid. Most bloom in winter and early spring and are not difficult to grow in the home. The fragrant flowers last for about a month, with color ranging from white to purple to yellow, orange, red, green and pink. The flowers may be quite large and showy. This orchid requires high light, but not direct sunlight. Temperatures should be 70 to 85 degrees F at day and 55 to 60 degrees at night, with humidity above 50%. Water mature plants weekly and feed after watering at quarter to half strength of the recommended label dilution. 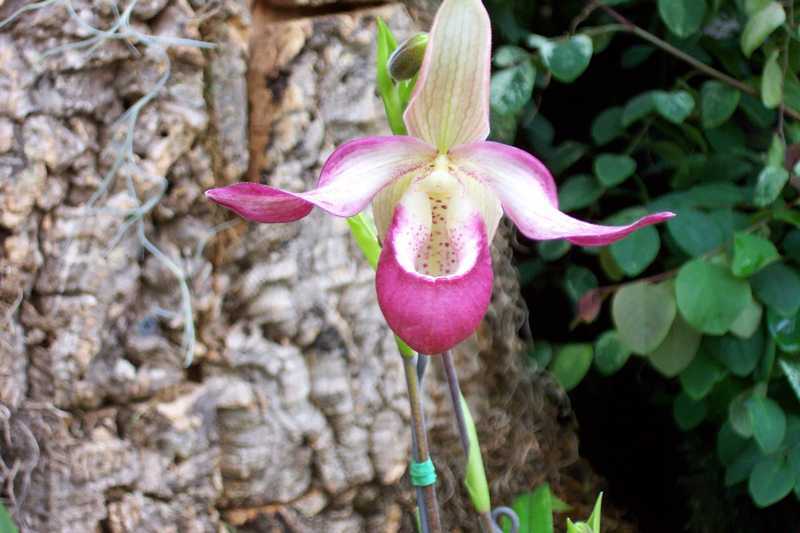 Commonly called the lady’s slipper orchid because of its unique pouch-like lower petal, it is not difficult to grow in the home. Flowers may be of many colors with patterns of stripes, veins and spots. Paphiopedilums prefer lower light levels; an east window is ideal. They like to be “tight” in their pots; i.e., don’t overpot this orchid. The mottled leaf varieties are warm growing (75 to 85 degrees F at day and 60 to 65 at night); the green leaf varieties are cool growing (in the 70s at day and 50 to 60 degrees at night), with humidity above 50%. Water mature plants weekly and feed after watering at quarter to half strength of the recommended label dilution. 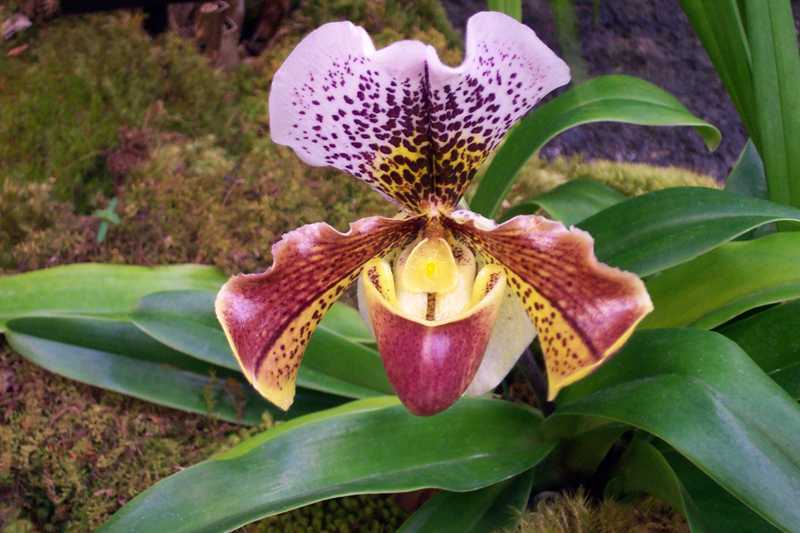 This is one of the largest and most diverse orchid genera with over a thousand species and a great variety in flower appearance and color. Some prefer warm growing temperatures, and others prefer cool. All require humidity above 50%. In order to flower well many species need a dormant rest period in the late fall when water is withheld for several weeks; others need no rest period. They prefer high light and humidity above 50%. Water mature plants weekly except during the dormant period and feed after watering at quarter to half strength of the recommended label dilution. 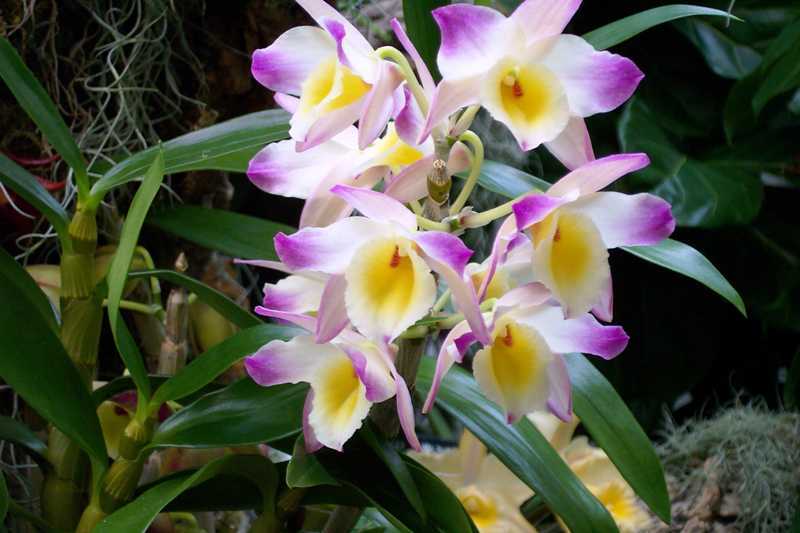 Dendrobium orchids are not difficult to grow in the home. 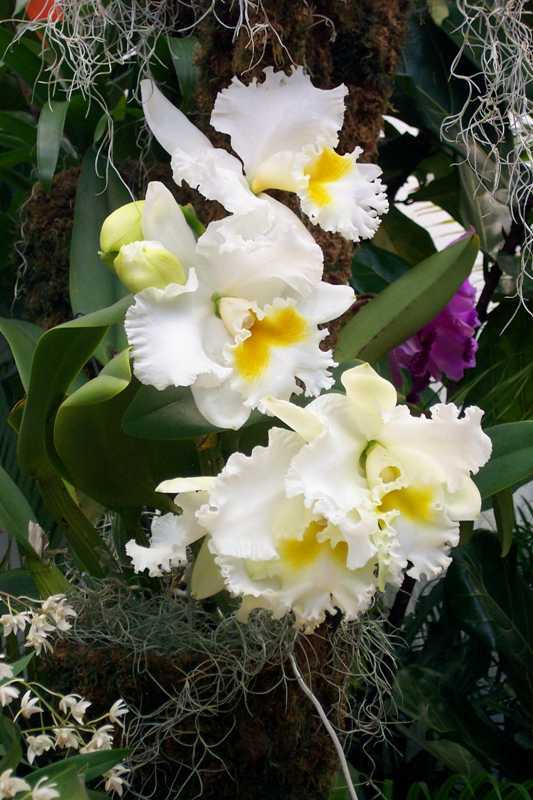 These orchids are large plants with strap-like foliage and long sprays of large, showy flowers in abundance. They are cool growing, preferring temperatures of 70 to 85 degrees F at day and in the 60s at night, with humidity above 50%. They will survive at temperatures nearly to freezing for short periods. Indeed, low temperatures at night in the fall initiate flower production. Flowers may be white, pink, green, cream, purple, orange, yellow, red, etc. They are long-lasting and work well as cut flowers. Cymbidiums like an east exposure inside the home and light shade if placed outside in summer. Water mature plants weekly and feed after watering at quarter to half strength of the recommended label dilution. 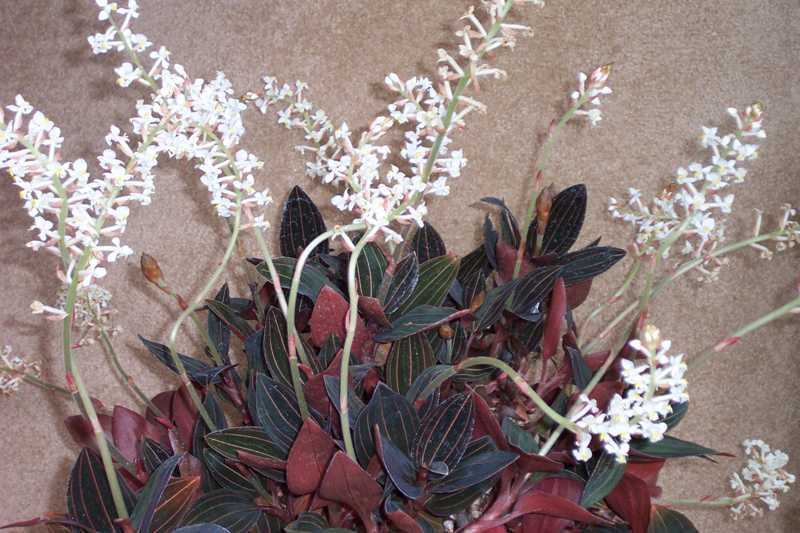 Ludisia is known as the jewel orchid. It is grown primarily for its exquisite foliage with velvety, dark green to purplish-brown leaves with gold to red veins. It is one of the easiest orchids to grow, and a stem cutting will root to form a new plant. It requires warm, humid conditions throughout the year, intermediate light and good air circulation. The upright flower spikes emerge from the center of the shoots. Many small, white flowers appear along each flower spike. Water with tepid water in the morning so foliage does not remain wet overnight. Fertilize regularly (weakly/weekly) with a balanced fertilizer diluted at quarter to half strength after thoroughly watering. 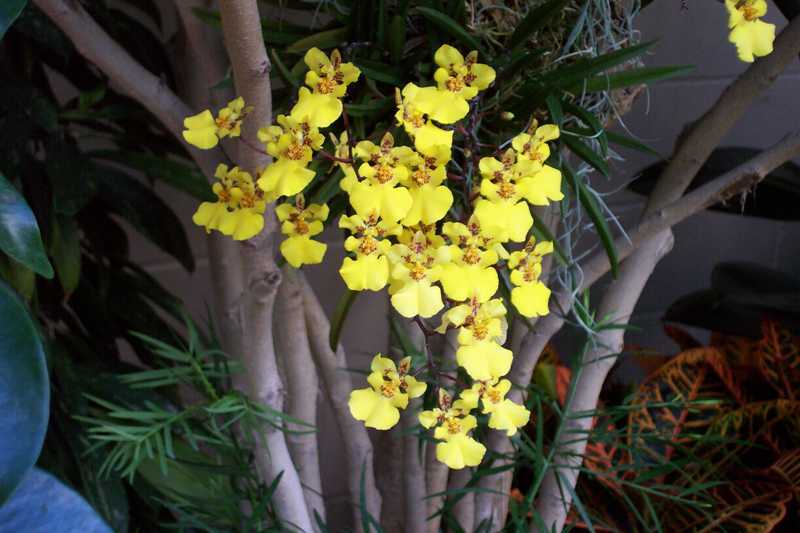 A large genus with about 700 species, Oncidium orchids are called dancing ladies. Their erect flower spikes are long and branching, bearing many small flowers, usually no more than one inch in size. In general flowers are yellow and brown. Easily grown in the home, they prefer humidity above 50% and intermediate to warm temperatures, with night temperatures 10 or more degrees F cooler. Feed weekly after thorough watering with a balanced fertilizer at quarter to half strength. When flowers have faded, remove the flower spike at its base. 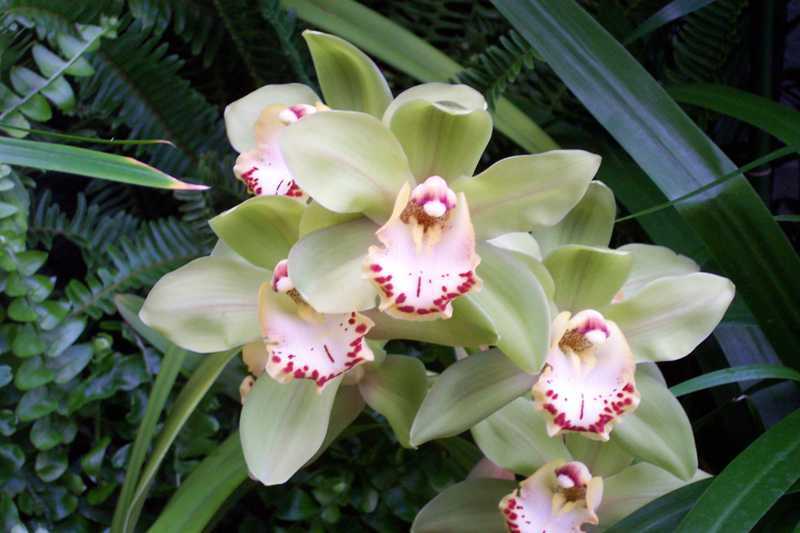 This large plant is called the nun’s orchid and can grow to 48 inches tall when blooming. Its large, thin leaves are broad and pleated. Its many striking flowers are held on long flower spikes, each plant producing many spikes. Flowers are white, yellow, purple and magenta. 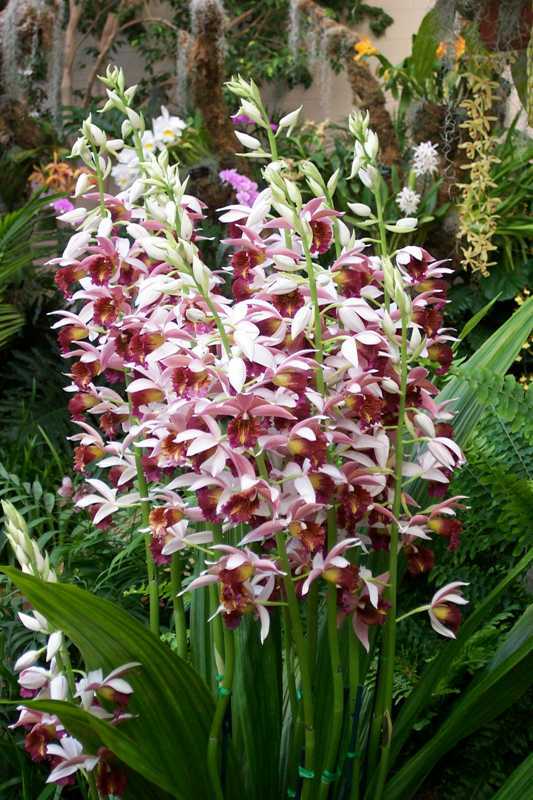 Phaius orchids are heavy feeders and are fond of organic fertilizers. Keep the plants moist but not soggy, and if leaf tips turn brown, water with rain water or distilled water. They prefer intermediate to warm temperatures, 65 to 75 degrees F, and bright light, but not direct sun. Humidity should be above 50%. Phragmipediums are lady’s slipper orchids from Central and South America. Their lower petal is pouch-like, thus their common name. Their distinctive and exquisite flowers come in many colors—green, pink, orange, red, and yellow, many with veins. Many plants flower in succession over a period of months. Foliage is long and strap-like. These orchids never should become dry, so it is important to grow them in plastic pots for more moisture retention. They require bright light, but no direct sun, and temperatures in the 70s and 80s degrees F during the day, and in the 60s at night. Air movement at all times is critical, with humidity above 60%. Feed weekly after watering with fertilizer diluted to quarter or half strength. These are among the most fragrant of orchids, blooming from late autumn to early spring with flowers lasting a month or more. Flowers are multicolored in purple, mauve, green, brown and white; with veins and blotches. They are easy to grow, preferring daytime temperatures in the 70s degrees F and 10 degrees cooler at night. These plants prefer fairly bright light but not direct sun. Light green leaves indicate the proper amount of light. Good air circulation is critical to prevent brown spots on leaves. 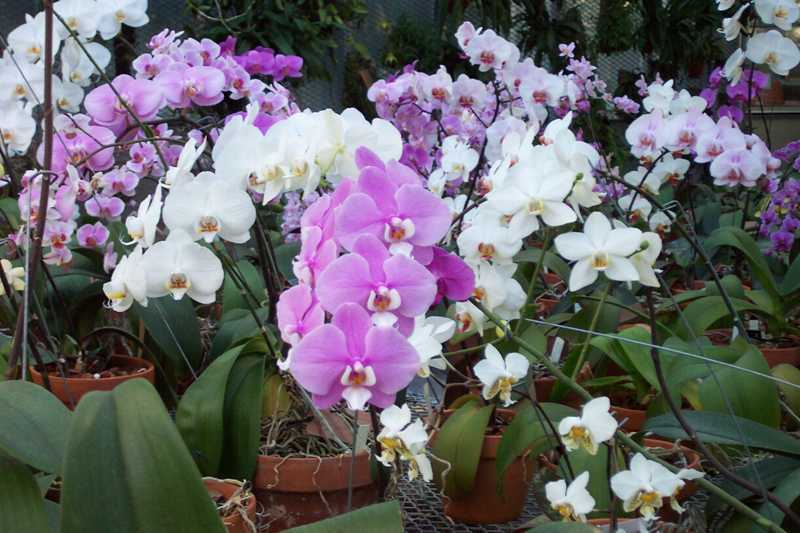 Maintain regular watering; these orchids should never dry out completely. Feed regularly after watering at quarter to half strength the recommended label dilution.